In 2011 I released my debut album as a leader, entitled Middleground. Below you can hear all the tracks streaming for free (gasp!) and if you feel so inclined, you can purchase them via download. 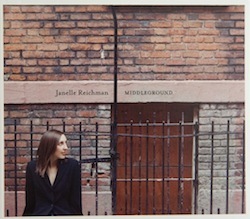 Below the tracks from Middleground you’ll find various tracks of me performing live in different settings. My own Clarity Trio live at Sycamore Bar, featuring myself on clarinet and vocals, Steve Whipple on bass and Randy Napoleon on guitar. My Master’s Recital at Manhattan School of Music, featuring myself on tenor sax and clarinet, Remy LeBoeuf on alto sax, Jon Barnes on trumpet, Fabian Almazon on piano, Steve Whipple on bass and Will Clark on drums. My Bachelor’s Recital at The University of Cincinnati, featuring myself on tenor sax, Steve Whipple on bass and Anthony Lee on drums.